Ash yellows is a devastating disease of ash trees and related plants. It can infect lilacs as well. Find out how to recognize the disease and what you can do to prevent it in this article. Ash yellows is a newly discovered plant disease, first detected in the 1980’s. It probably existed long before that, but wasn’t detected because the symptoms are so similar to those of other plant diseases. In many cases, you won’t be able to get a firm diagnosis without laboratory tests. A tiny, mycoplasma-like organism that we call the ash yellows phytoplasma causes the infection. A disease that infects members of the ash (Fraxinus) family, ash yellows only exists in North America. The symptoms are similar to those of environmental stress and opportunistic fungi. Although we see it most often in white and green ash trees, several other species of ash can also become infected. Ash yellows doesn’t discriminate about location. We find it in commercial woodlots, natural forests, home landscapes and urban plantings. Dieback may be rapid or very slow. Although it may be several years before the tree deteriorates to the point where it is unsightly or a danger to your landscaping and buildings, it’s best to remove it promptly to prevent the spread of disease. Replace it with trees that aren’t members of the ash family. It may be as long as three years after infection before the symptoms of ash yellows appear. An infected tree usually grows at about half the rate of a healthy tree. Leaves may be smaller, thinner, and pale in color. 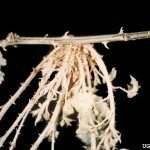 Infected trees often produce tufts of twigs or branches, called witches’ brooms. There is no effective ash yellows disease treatment. The disease is spread from plant to plant by insects. The best course of action if you have a tree with ash yellows is to remove the tree to prevent the spread to other trees. Does this mean that you have to give up ash trees and lilacs in the landscape? If you know there is a problem with ash yellows in the area, don’t plant ash trees. You can plant lilacs as long as you choose common lilacs. Common lilacs and hybrids of common lilacs are known to resist ash tree yellows.